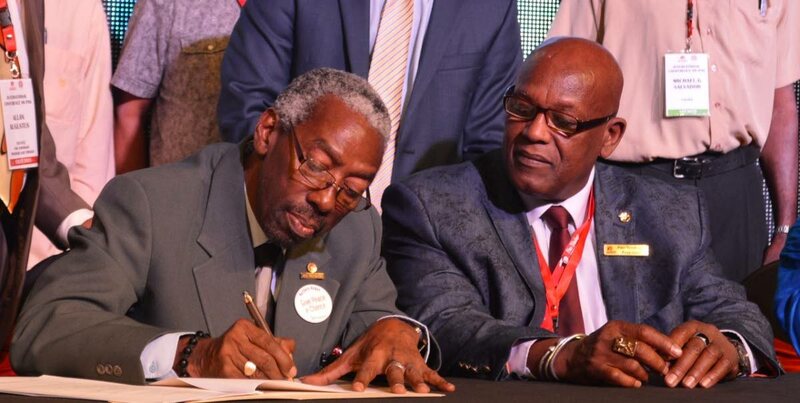 Pan Trinbago secretary Richard Forteau (left) and president Keith Diaz at the signing of a memorandum of understanding in 2016. CHAIRMAN of the National Carnival Commission (NCC) Winston “Gypsy” Peters said yes, his body has signed an agreement with Pan Trinbago, but denies it has taken control of the pan organisation. He said similar arrangements are being worked out with the other Carnival interest groups, the National Carnival Bands Association (NCBA) and the TT Unified Calypsonians Organisation (TUCO). Peters warned that there would be realignment and cost-cutting in accordance with the NCC’s mandate to look after Carnival affairs on behalf of the government and for these interest groups to account for the people’s money, especially at a time when resources are scarce. He said salaries for Pan Trinbago amounted to over $400,000 a month because the organisation has offices “all over the country,” and this would have to change. Peters was responding to media reports that the NCC had taken control of the pan body and that a memorandum of understanding to this effect was signed on Tuesday with Pan Trinbago’s president Keith Diaz and treasurer Andrew Salvador. A social media post alleged that secretary Richard Forteau opposed the arrangement and refused to sign. In a radio interview on Wednesday morning, Diaz said Pan Trinbago was still in charge of its affairs and he saw nothing wrong in signing an agreement with the NCC, which wanted greater accountability for the money invested. Diaz said since his involvement in the steelpan movement from the 1960s, government has always funded Panorama, paying the judges, prize money, appearance fees for the bands, and transportation for them from Tobago to Trinidad. Forteau said Pan Trinbago had forfeited its rights and its role has been reduced to one of management. He questioned the timing of the agreement just before elections are due, saying in the past these same players have questioned the signing of documents before they demit office and he wondered about the hypocrisy. It stressed, “The NCC has not in any form taken over the running of Pan Trinbago. The president and treasurer, Messrs Keith Diaz and Andrew Salvador are signatories to a MOA which speaks to the funding of Pan Trinbago’s operations, events and, development programmes. It said Pan Trinbago as a responsible organisation recognises the usefulness of accountability and transparency. The release also took aim at Forteau, saying he was never a signatory to the document. Reply to "Pan Trinbago signs with NCC – NCBA,TUCO next"